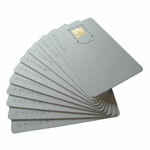 Microcontroller-based and high secure chip/smart-cards. All chipcards are fully compatible with the Infinity USB Unlimited, Infinity USB Smart and Infinity USB Phoenix hardware. Contact us for volume orders. Atmel ATMega8515 + 24C64 plain white smartcard, with 64 Kbit of EEprom. Superior replacement/alternative to discontinued AT90S8515 based cards. Suitable for secure data storage applications, for instance using the WB-Loader AES. ATMega8515 + 24C64 based cards are the first to get full support in the AES 256bit version of WB-Loader. 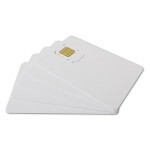 Can be customized with for instance larger external EEprom or flash memory (up to 64Mbit). 25-April-2019: Large stock for immediate delivery! Atmel AT90S8515 + 24C1024 plain white smartcard, with 1 Mbit of EEprom. Suitable for secure data storage applications, for instance Infinity Passwordsafe or development projects using the WBLoader. In stock, but discontinued. For long term support, use ATMega8515 + 24C64 instead. 25-April-2019: Medium quantity in stock. Atmel AT90S8515 + 24C512 plain white smartcard, with 512 Kbit of EEprom. Atmel AT90S8515 + 24C64 plain white smartcard, with 64 Kbit of EEprom. 25-April-2019: Small quantity in stock. Consider 64 Kbit ATMega SIM instead. 64kbit blank smartcard, based on Microchip PIC16F877+24LC64. SIM form-factor precut, can for instance be used for SuperSIM experimentation and projects.